I admire architects for their visionary ideas, for being able to transcend established limits, for pushing things beyond the common … at least when still in early phases of a project. 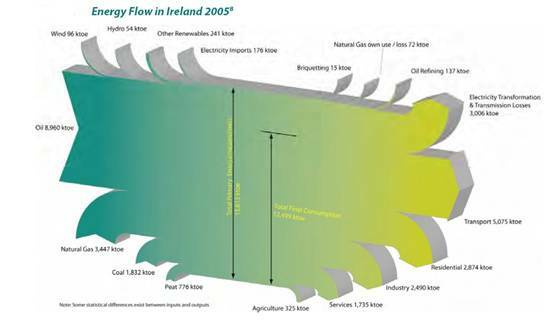 This looks at first sight like one of the classic ‘national energy flow’ Sankey diagrams with fuels (production) on the left, distribution and consumption on the right. But this is only partly true. Look at the right part where the energy flows stack and have a vertical time line. 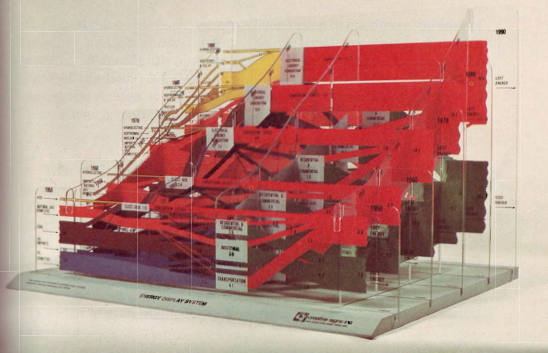 So forget about scale and units here … this is a concept diagram! 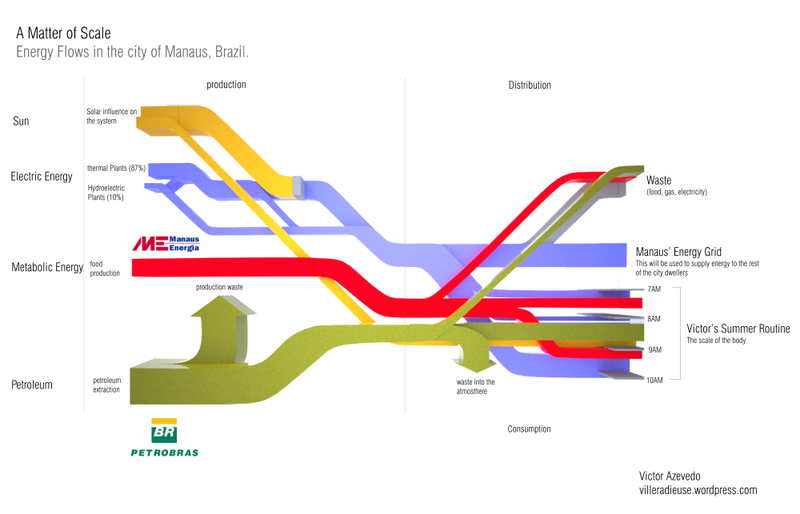 The Sankey diagram links an individual’s consumption patterns with the bigger picture, thus stressing everybody’s personal share and responsibility in energy consumption (and the possibility to take action). Kudos for this idea! 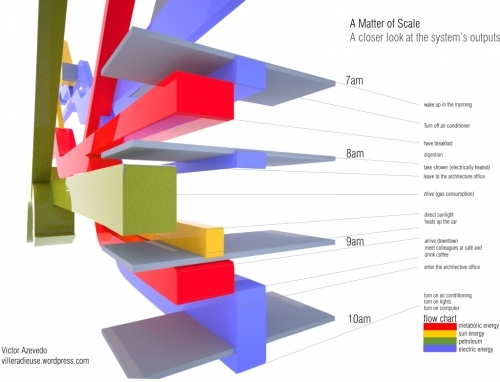 Apart from that it is of course a fancy 3D rendering, and I love the rotation and close-up of the morning routine. Make sure you post a comment directly at Victor’s post, if you like it as much as I do! Note: Somewhat related, check out Molly Eagan’s ‘Where is Petroleum in our Daily Lives’ here. Found on cyclifier.org, a project run by Dutch 2012Architecten: This 3D Sankey diagram by Anna Brambilla visualizes flows of food from producers to the Rotterdam foodbank and onto low income households. 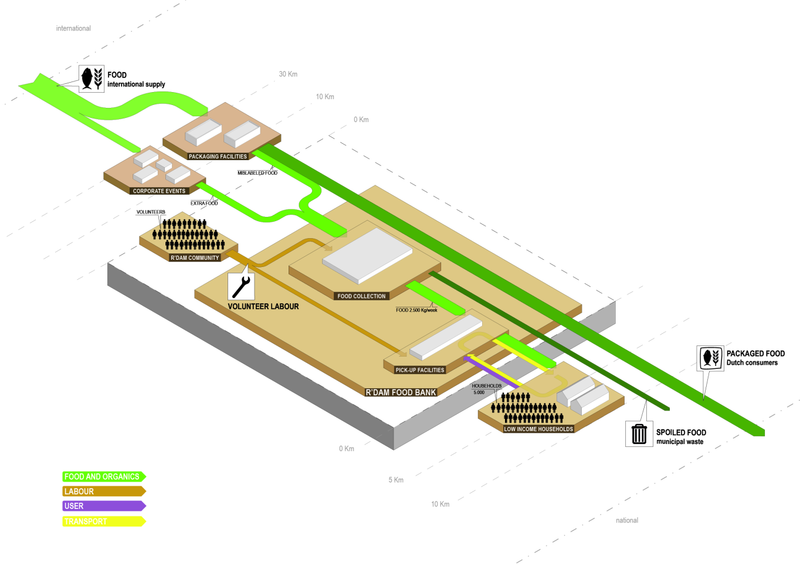 So, we have ‘Food and Organics’ flows (green), transport (yellow), users (purple) and even volunteer labor (brown) represented in the diagram. No numbers or units given though. Since cyclifier.org is interested in promoting “innovations that contribute to local exchange and production”, distances of producers to the foodbank and to the consumers are indicated on a somewhat logarithmic scale. 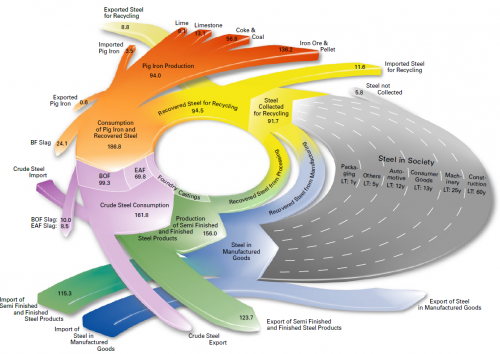 Very cool Sankey diagram, kudos! 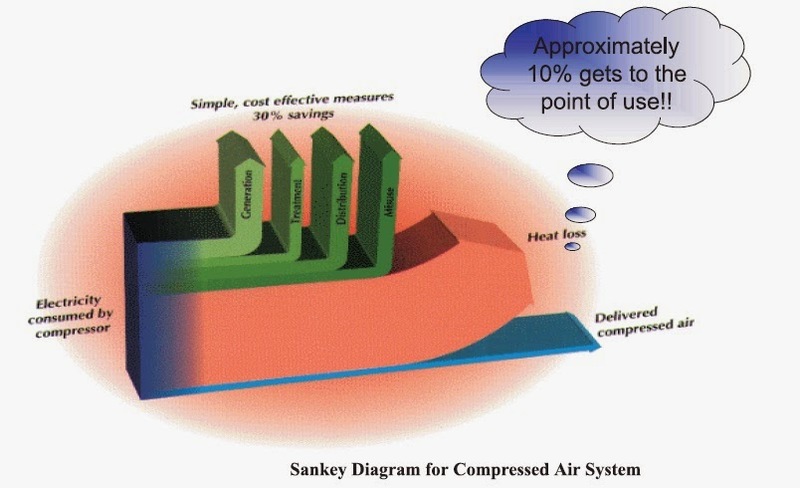 You might remember the radial Sankey diagrams “invented” by Visio guy (here). This 3-D version below left me speechless… I hope the guys at junkcharts dedicate a critical evaluation to it…. This is from EUROFER (The European Confederation of of Iron and Steel Industries) and shows steel flows in fifteen European countries (EUR-15) in million metric tons. Values are for 2004. The grey area is supposed to represent steel accumulated in capital goods (machinery, buildings, …) over a certain life time. Whooo woah, that’s a merry go round, I feel dizzy already! A follow up to this 2009 post. 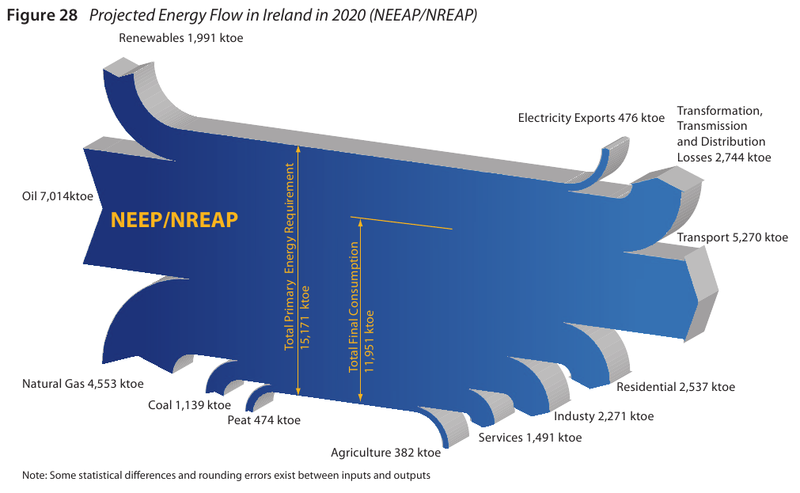 Here is a 2020 energy flow Sankey diagram for Ireland. This is one of many interesting graphs to be found inthe post ‘A Review of Green Energy Growth Prospects at the Oil Economy Maxima’ on the ASPO Ireland (Association for the Study of Peak Oil & Gas – Irish Chapter) blog. The World Business Council on Sustainable Development (WBCSD) in an article on “Making Tomorrow’s Building’s More Energy Efficient” features a great three-dimensional Sankey Diagram, to illustrate that “more than 90% of the energy extracted from the ground is wasted before it becomes useful work”. The article calls for green buildings where energy is produced onsite, and losses are minimized. The Sankey arrows representing the losses bend down sharply, they remind me of the Iguazu Falls. 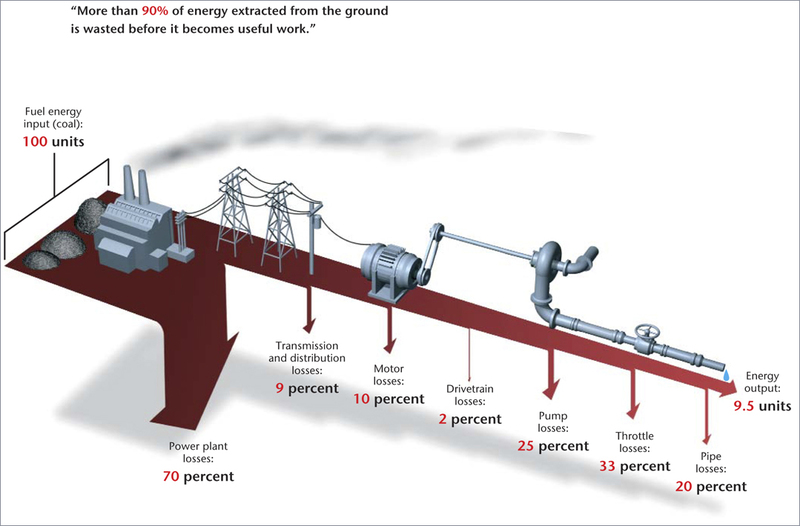 Neat 3D images of the equipment are placed on the diagram to visualize the process steps where energy is lost. The whole thing hovers over the ground throwing a faint shade. The graphic designer who did this really merits an applause. If ever I launch a ‘Best Sankey Diagram Award”, this one will have good chances to win it. Any sponsors out there? Any volunteers for the award jury?